Last year I read many books, as always. Some were old favourites, some new. Of the outdoor books that were new to me here are the ones that impressed me most, in no particular order. Some were physical books, others electronic ones read on a Kindle e-reader out in the wilds (a couple of books made it into the pack too – Fiva and Wild Voices). All are recommended. 8000 Metres: Climbing the World’s Highest Mountains by Alan Hinkes. This had just arrived when I wrote last year’s books piece so it was the first book I read in 2014. I found it exciting, dramatic and astounding. As the ascents build up, each described tersely but evocatively, the enormity of the achievement grows. The book is packed with wonderful photos too, making it a volume to go back to just to look at them again. I’ve been dipping in and out of this fascinating book since it arrived last spring. It’s basically a book about understanding what you see when out for a walk. It reminds me of the naturalist’s handbooks I read when I was young and starting to explore the countryside. It’s not a field guide to identifying birds or plants or clouds or whatever though. It’s much subtler than that. It’s about what the things you see mean and how to look for them. I’m learning a great deal from it. Many outdoor writers take inspiration from other outdoor writers. I certainly do and many of my long walks were initially inspired by books. 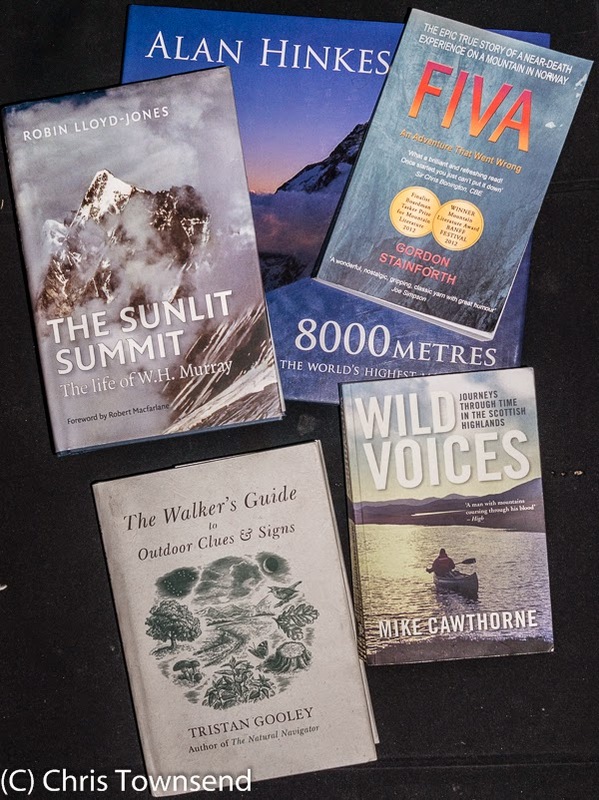 In this book Mike Cawthorne takes this much further as he journeys through the places described by seven authors and tries to feel the landscape as they did. Of the seven writers I’d only read one – poet Norman MacCaig – and a couple I’d never heard of before. Mike’s journeys are well-described and involve exciting adventures and visits to places few walkers or canoeists ever traverse (I wonder if anyone else has ever canoed the maze of lochans on the Isle of Lewis?). Many, many years ago I read W.H.Murray’s Mountaineering in Scotland and Undiscovered Scotland and was inspired to explore the Scottish hills in winter. I still think these are two of the best books on climbing in the Highlands. Later I read other writing by Murray including his descriptive and powerful Scotland’s Mountains and discovered that he was a passionate conservationist as well as a top mountaineer. This biography is fascinating, especially in its description of Murray’s core mystical beliefs, though even after reading it I’m still not sure exactly what they were – but then I generally find mysticism puzzling and elusive. This is a glorious book, glorious for its descriptions of eagles and the author’s interaction with them and glorious for the author’s enthusiasm. Jim Crumley has studied eagles in Scotland for many years and in this book talks about the effects of the reintroduction of white-tailed eagles and how they are spreading along their old routes. Along with the author’s The Last Wolf and The Great Wood this book is part of an important trilogy about nature and wildness in the Scottish Highlands. There’ll be a longer review in the February issue of The Great Outdoors. Most climbing books describe great ascents and major achievements by top mountaineers. This book is different, telling the story of two novice climbers attempting a route that proves way beyond them on the massive Troll Wall in Norway back in 1969. They lose the route, the author has an accident and even when they finally reach the top of the cliff they can’t find the descent route. It’s a real nightmare epic for the two climbers but for the reader it’s gripping and exciting. Most people find climbing the Munros in the Scottish Highlands tiring enough in daylight after a good night’s sleep. Due to his work schedule Alan Rowan had little chance to do this so he started climbing them at night after work and then returning to work the next morning. I find this astonishing! It did mean he saw many wonderful sunrises and had many exciting adventures and the book describes these well. It’s definitely a new take on Munro-bagging. What do people in America think about climate change? To find out Kate Rawles cycled from Texas to Alaska, roughly following the line of the watershed of the continent, talking to people about it along the way and discussing what it means for Western society. The book also covers the rigours of the journey, the landscape and wildlife and is an entertaining and thought-provoking read. Published in 1949 I found this gem while browsing in a second-hand bookshop. It tells the story of the author’s explorations of the Cairngorms back then. These are interesting in themselves but also fascinating are his descriptions of the landscape as it was, particularly the forests which were far more in decline than they are now. The book is illustrated with many black-and-white photographs. I especially like the one of the author skiing in shirt and tie! Hi Chris. How much does 'Sunlit Summit' add to what is already told in Murray's own autobiography, 'The Evidence of Things Not Seen'? I think it gives a different perspective and it covers parts of his life not mentioned in 'The Evidence of Things Not Seen'. The latter, which wasn't complete when he died, is a bit of a mess with long sections from previous books added. It's an interesting book but nowhere near a full autobiography. Thanks Chris. His autobiography certainly isn't the book it would have been had he lived to complete it himself.